MINI, official partner of Team GB and Paralympics GB, has unveiled its new London 2012 special, limited edition models to celebrate the London 2012 Olympic Games. There will be just 2012 of these special edition models built, available in Cooper, Cooper D, Cooper S and Cooper SD trims and all come in Union Jack themed colours; Chilli Red, White Silver or Lightning Blue. 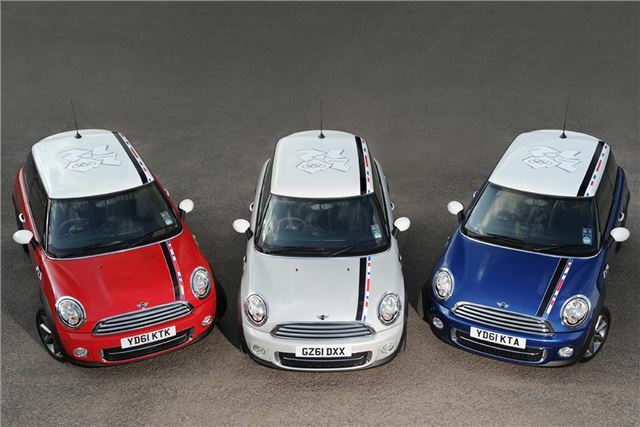 All models boast white mirror caps and a white roof featuring the iconic London 2012 Olympic graphic. The exterior also features a distinctive Union Jack single sport stripe which runs over the bonnet, roof and rear tailgate of the car. The side scuttles also bear the London 2012 Olympic graphic. To finish off the dynamic look, the MINI London 2012 edition features unique grey 17-inch conical spoke alloy wheels - unavailable on any other MINI model. Inside, the most striking feature is the London skyline, beautifully etched across the width of the piano-black dashboard. Silhouetting some of London's most iconic landmarks, including Tower Bridge, Battersea Power Station and the London Eye, the dashboard also displays the words "London 1 of 2012". The London 2012 inspiration continues with red and blue stitching twined with white piping on both the front and rear Black ‘Lounge Leather' upholstery. The headrests complement the theme with Union Jack piping and a London 2012 logo is stitched on the inner edge of both front seats. Coloured stitching also features on the hand brake, gear stick gaiter and floor mats which also have piping. All London 2012 special edition models come packed with a bundle of extra options like Lounge Leather sports seats, DAB radio, air conditioning, cruise control and chrome interior touches. MINIMALISM technology* also comes as standard; helping to make the 99g/km CO2 emitting Cooper D models exempt from London Congestion Charging.